After having your front entryway remodeled for your Phoenix home, you’ll likely be the center of much of the neighborhood’s attention. With a new front door, front walkway, and even stained glass accent pieces for your windows and doors, passersby won’t be able to ignore the beautiful new space you’ve crafted. But an often underappreciated piece of your entryways aesthetic is the hardware on your door. While these pieces look bright, shiny and new when first installed, they can quickly lose their luster. 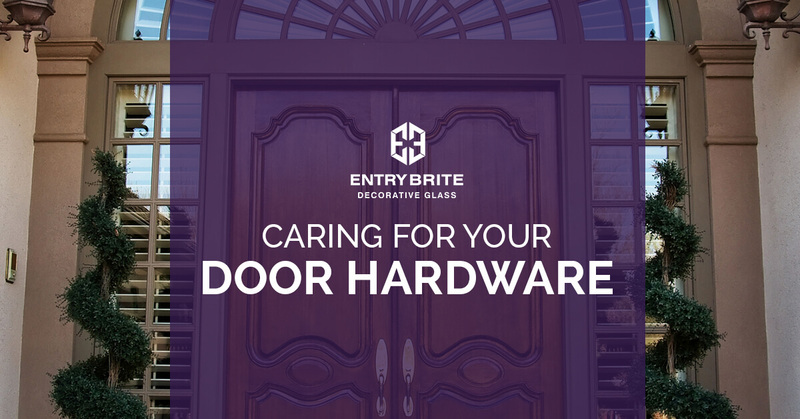 To keep every part of your remodeled entryway looking its best, follow these handy hints from Entry Brite in Phoenix. There are a few reasons that you should make cleaning your front door hardware part of your regular cleaning regimen. First, you likely already take care of your front entryway by sweeping away leaves or grass clippings, dusting cobwebs, and even power washing the windows and doors. This keeps your entryway looking bright and welcoming. But if you skip your hardware, your visitors will notice it sticking out like a sore thumb. Secondly, keeping your door hardware clean also ensures that it continues to function properly for many years. If dirt and debris from your yard and oils from your hand work their way into the door handles mechanisms, it could cause it to jam or even break. With this in mind, here are some cleaning tips for common door hardware types. Chrome finished hardware is prized for its brilliant finish and reflective qualities. Because the hardware is plated in chrome, this makes it very easy to clean. To keep your chrome door hardware clean, simply wipe it down with a damp cloth. If it has been a while since you’ve cleaned your chrome hardware, you can use a high-grade chrome polish to return its fabulous shine. Keeping your clear-coated hardware clean is also fairly simple. Make a solution of water and non-abrasive soap and wipe down the metal components. Once dry, you can buff the hardware with a soft cloth. To keep the finish looking shiny and new, you can even use a car wax type product to protect it from the elements. Avoid using chemical cleaners, solvents, or abrasive soaps as these products could degrade the finish. Unlike the other finishes, an oil-rubbed finish is meant to change and patina over time. The initial flat brown coat of finish eventual gives way to a natural copper color. To ensure that this transition occurs gracefully and evenly, simply wipe down your hardware with a light coating of vegetable oil and use a soft cloth to buff the oil. This adds a protective layer. To make the finish shine, you can use a non-abrasive furniture polish. Keeping your door hardware clean and polished is part of creating a harmonious entryway aesthetic. You’ll love the way the front of your home looks when everything seems to work together. If you’re looking for an entryway remodeling service in Phoenix, look no further than Entry Brite! Work with our team of artists and craftsman to create a striking entryway for your home. Contact us today!